Do you remember what your favorite candy was as a kid? I liked most candy as well as the next kid, but for a couple of years in my early teens, I was obsessed with Heath Bars. Oh, how I loved those bites of chocolate covered toffee. I loved how the bar would snap when I took a bite. I loved the crunching sound the toffee made while I chewed, and the chocolate, well the chocolate was the icing on the cake. 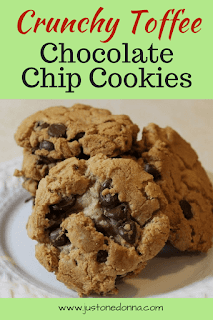 What could be better than toffee chocolate chip cookies? I've grown out of that obsession. Yes, I gave up the Heath Bar long ago. As a matter of fact, I can't remember the last time I had one. A few weeks back, while perusing the chocolate chip options at my local grocery store, a bag of Heath English toffee bits called out to me. You know what I do when something calls to me from the grocery store shelf? Well, I buy it, of course. A cookie made with these toffee bits seemed like a good idea. The basic recipe for a Toll House cookie came to mind as an option for a yummy base for the toffee cookie. Then I remembered the Perfect Chocolate Chip Cookie recipe. That's the one where the butter is melted before being mixed with the sugars. That cookie has a lovely buttery, toffee flavor as well. So, I decided to make a cookie that combined the Toll House recipe, the Heath toffee bits recipe, and the Perfect Chocolate Chip recipe. The cookie that resulted is hearty, crunchy, and chewy all at once. Mix the flour, baking soda, and salt together in a medium bowl. Set aside. Melt four tablespoons of butter in a skillet over medium-high heat until melted, about 2 minutes to 3 minutes. Swirl the pan constantly, cooking the butter until it is golden brown and has a nutty aroma. That will take 2 to 5 minutes, depending on your stove. Remove the skillet from the heat and pour the butter into a heatproof bowl. Add the remaining butter and stir to melt. Add the sugars, and vanilla to the bowl. Stir to combine. Add the eggs, whisking to combine, about 30 seconds. Let the mixture stand for 3 minutes. Repeat this 30-second whisk and 3-minute rest process two more times. Transfer the butter mixture to your electric mixer. Add the flour mixture all at once and stir to combine. Add the toffee bits and chocolate chips, mixing just to combine. Your batter will be thick and relatively dry. Using a scoop, scoop equal portions of dough packing the dough tightly into the scoop. Then use the bottom of a measuring cup to slightly flatten each cookie.